Wall pockets really hit their peak of desirability during the 1940s and ‘50s. After their popularity waned with homemakers and decorators, it took a while for them to catch on with collectors. Yes, these interesting collectibles were left lingering on antique shop shelves for quite some time. Now, however, wall pockets are favored finds with antiques dealers and collectors alike. This is especially true when it comes to popular pottery examples and hard-to-find pieces by a number of well-known makers. Wall pockets made by Roseville, Weller, and Rookwood found favor with dealers and collectors prior to other more kitschy examples. Wall vase patterns made by these pottery companies often matched other lines they produced, as with the Magnolia example shown here with matching candleholders, and they can be quite pricey in many instances. For example, a pristine Roseville Wisteria wall pocket sold on eBay for $895.50 in July of 2016, and a Blackberry pattern piece with its unusual triangle shape topped out at $325 in the same time frame. By and large, the only bargains to be found in Roseville wall pockets are damaged or repaired pieces and even those can sell in the $50 range depending on the style and pattern. A hard to find Weller Roma wall pocket sold on eBay for $295 in August 2016. That’s somewhat atypical, however. Most Weller wall pockets sell for more reasonable prices these days. A few approach $100 or so but many are available for $50 or less. Grueby wall pockets, on the other hand, can be quite hard to find. A rare Grueby example in an elongated shape with carved and applied leaves glazed in green was listed in a recent edition of Warman's Antiques & Collectibles for $1,952. If you're up for a challenge and have lots of expendable cash, this is the way to go when it comes to wall pocket collecting. There are reproductions to deal with as well, and this is especially true of Roseville pieces. It’s hard to visit a bustling flea market now without running across pottery reproductions, and wall pockets are no exception. The quality of the decoration on these pieces is usually a dead giveaway, but it’s wise to take care when you’re buying from an unfamiliar dealer. Fervently crafted until the 1950s, there were thousands of wall pocket styles made over the years. These popular decorative accessories were shaped like teacups, parrots, irons, bananas, and flowers, just to a name a few themes, and they hung on the walls of the most fashionable homes of the day. Unmarked American wall pockets and imports from Germany, Czechoslovakia, China, and Japan weren't nearly as popular as the big names until just a few years ago. It was just a matter of time until the collecting cycle caught up with these kitschy wall decorations. They look great decorating a wall in themed groupings. Even so, most of them still don’t command values equivalent to that of other pricier pottery examples like the ones mentioned above. For collectors just being drawn to these space-saving trinkets, bargain wall pockets can still be found in the $20-30 range. 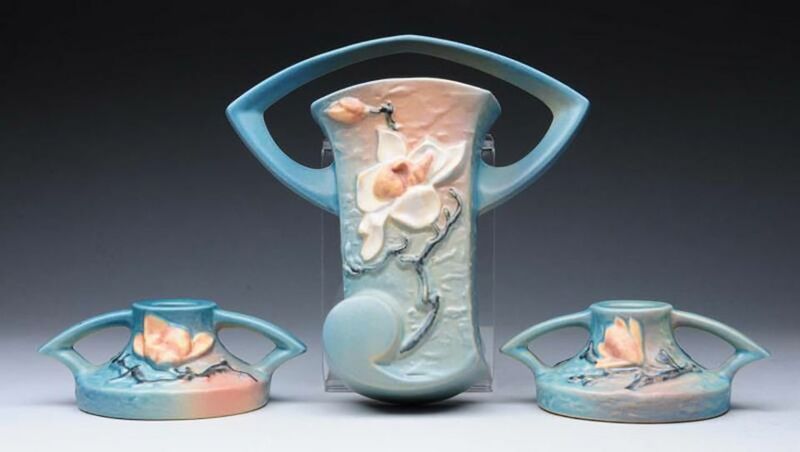 These will generally be unsigned or plentiful styles made by well-known potters. Different glaze variations on the same piece or different styles in a series can result in variations in price. A number of the plentiful wall pockets made by McCoy fall into this category. For instance, a hard-to-find McCoy orange wall pocket usually sells for $100-150 but a more common pear or apple wall vase also marked McCoy, can usually be found in the $25-30 range. As another example, a McCoy grape wall pocket that can vary from $40 to $200 depending on whether the leaves are green or brown. For this reason, a good reference book to guide in distinguishing nuances like these can make a world of difference when pricing items for sale or shopping to add to a collection. Look for Collector's Encyclopedia of Wall Pockets by Betty and Bill Newbound and Collector's Guide to Wall Pockets, Affordable and Others by Marvin and Joy Gibson (both out of print but available through used booksellers) as good references on this topic.